This multiple stone brooch includes a central thistle flower, Scotland's emblem. 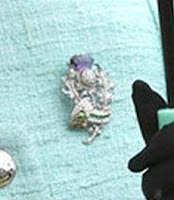 The brooch appears to be mainly metal and diamonds, with a carved purple stone at the top and green stones incorporated in its base (amethyst and emerald seem likely). This brooch does not get many outings, but it has been in the Queen's collection for a while; she notably wore it while in Scotland during her Golden Jubilee. 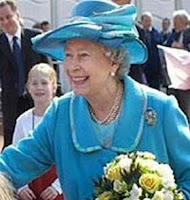 Naturally, the thistle motif lends itself well to Scottish engagements.